If there's anything that elementary school taught us, it's that ancient history is scary. And not just because of the unexpected pop quizzes and the essay tests. History is full of intense cultures with their dead ancestors, superstitions, hidden secrets, and skeletons. Another thing that's pretty scary? Well, how about human anatomy? The human skull is pretty frightening with its ever-open eyes and giant toothy smile. This Aztec Skull Mask combines history and human anatomy into one dreadful mask. This scary costume mask is intricately detailed and molded into the shape of a ghastly skull with ancient, weathered looking bones and shattered teeth. 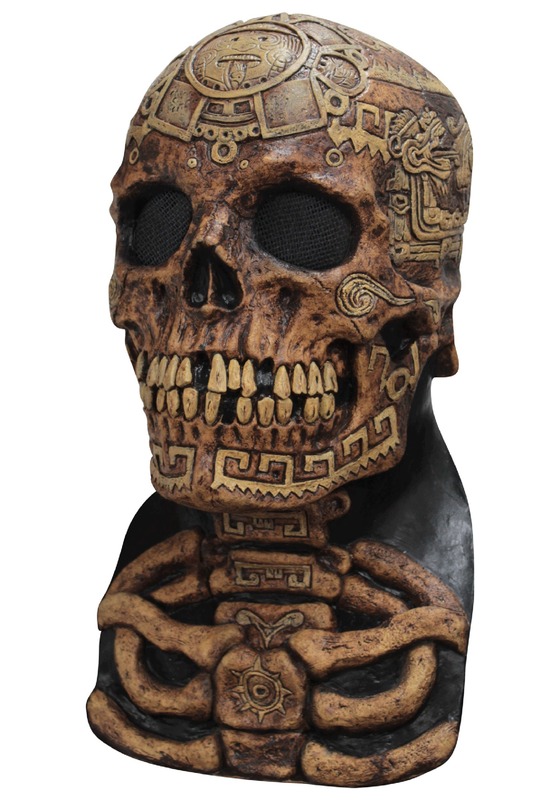 Much of the skull has a Aztec style engravings on it, giving it an ancient mystical look. It's the kind of mask you'd wear if you want to frighten small children, or if you just want to looks super cool. You can't deny that bones and history (although sometimes spooky) are super cool.